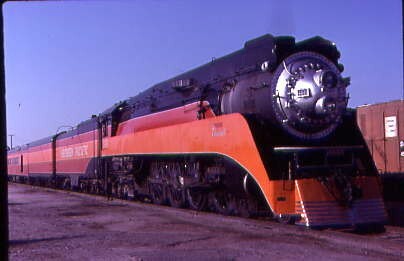 In the late Spring of 1984, it was announced that the former Southern Pacific Daylight Locomotive 4449, a 4-8-4, would pull an All Daylight Passenger consist from Portland to New Orleans for the World's Fair there. It would be called the World's Fair Daylight in honor of that event and tickets would be sold for each of the train's daylight running segments. 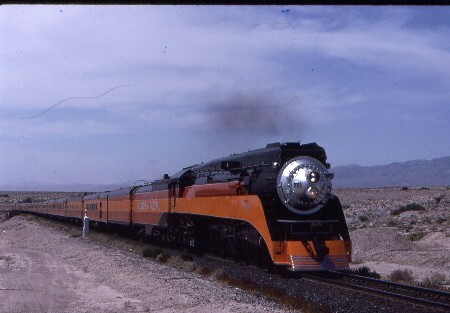 I wanted the two day trip Oakland to Los Angeles run over the Tehachaphi Loop but everyone and their brothers also had the same idea so that trip sold out almost overnight. A two day Phoenix to Los Angeles trip on the train's return from Portland was then announced and since it covered the route that the Sunset Limited runs over during the night, it seemed to be the perfect option for me. I called Mountain Outin Tours and the price would include my Amtrak tickets to Phoenix and back from Los Angeles to Santa Ana, the 4449 west Phoenix to Los Angeles and hotel with transfer in Yuma. 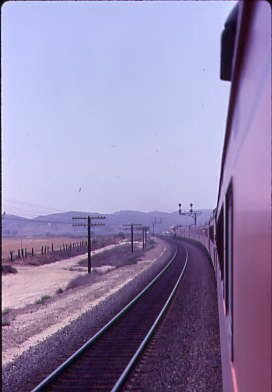 Following extensively photography of the train's eastbound run with my friend Bill Compton from north of Bakersfield to Ferrum along the Salton Sea, I finished up another school year at MacArthur and boarded San Diegan # 581 for the quick trip to Los Angeles. Here I met up with the group from Mountain Outin Tours. 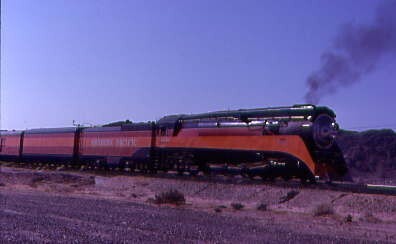 Our group was split into two smaller groups for the trip to Phoenix, mine would be taking the Sunset Limited straight to Phoenix while the other group would take the Southwest Chief to Flagstaff then a bus to Phoenix. We boarded our Sunset Limited coach which our group was assigned the entire car to ourselves. I took a full right hand window seat and managed to have a window seat all the way to Phoenix. 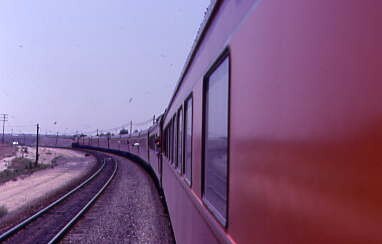 The Sunset Limited left Los Angeles on time with our group taking over the Sightseer Lounge Car. I enjoyed an evening of drinking and sharing railroad stories with my new found friends. The train went east via the Alhambra much to the liking of our group in the lounge car. The conversations came to a halt at Pomona when everyone spied the condition of the station building there. Conversations returned to high spirits as the train continued east through SP's West Colon Yard and then interests turned to the train's passage of Colon Tower. 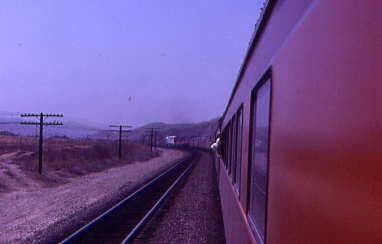 The train made the twisting and turning climb up San Timor Canyon where we met three opposing freight trains. As the Sunset Limited crested the grade at Apex, I returned to my seat falling asleep of what awaited me tomorrow when I would be on the extra 4449 West. We arrived at Phoenix on time on a bright and already hot Saturday morning alongside the beautiful Daylight train. Our group were immediately taken by bus to a hotel fifteen minutes away for a buffet breakfast which was really good. We returned to the depot and most of our group headed to the locomotive to get some pictures of the engine. Departure time came and went as we learned that our other group on the Southwest Chief arrived Flagstaff two and a half hours late and would be here as soon as the buses could bring them here. The desert temperatures continued to rise into the low hundreds with almost everyone seeking shade either in the depot or under the overpass by the engine. The buses finally arrived and I boarded my ex Shasta Daylight coach to await departure. 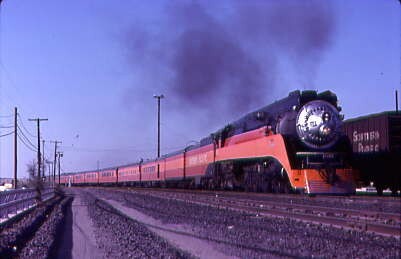 We one long blast of the whistle, extra 4449 West slowly started moving west. 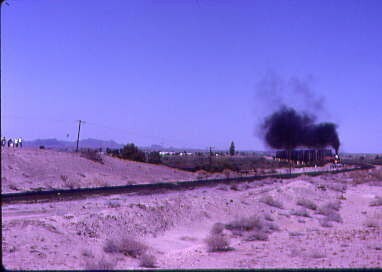 As the train curved, I could see the engine bellowing huge amounts of black smoke into the very hot desert sky. The train's air conditioning sure felt good after being out in the legendary Phoenix heat and all around me their was excitement inside the car. The train left Phoenix via the industrial areas of town and everywhere people were to watching and waving their hearts out as we went by. It's not every day a steam locomotive travels through a town in the United States. There's probably more excitement on the ground than aboard the train. 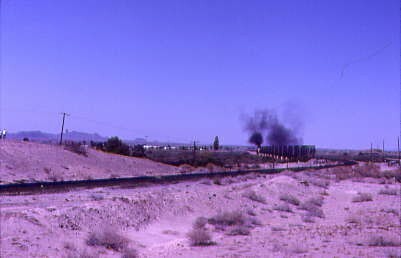 At one grade crossing I spotted two guys from JVC video from Florida who I had met in Phoenix who was going to be following the train all the way to Los Angeles. they gave me their card so I will definitely buy their tape. 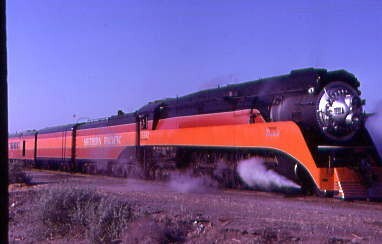 Past Buckeye, the train escaped the urbanized congestion of the greater Phoenix area for the desert where the Saguaro Cactus began to make an appearance. I love Saguaros, as each is an unique individual with no two ever exactly alike. They are fascinating plants and they amaze me just how well they have adapted to their hot and dry environment. The countryside had turned more rocky and the seem to thrive in rocky environments. The desert has a beauty all of it's own with nothing hiding the beautiful visits. The extra 4449 West made an unexplained stop on this single track railroad and I went to an open vestibule for a look see. 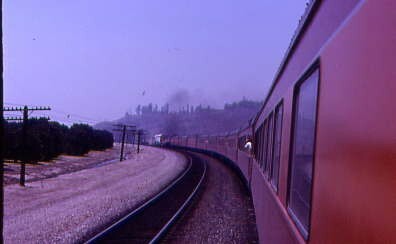 The train was stopped at a red signal but not the searchlight type instead an upper quadrant semaphore. 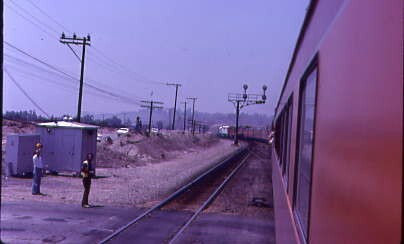 This was indeed a strange sight to see a steam train semaphore signal in the 1980's. It turned out that we had to stop on account of a red signal and after a call to the dispatcher from our engineer, our train was allowed to head west once more. The train's route had been following the Salt River down it's valley to the west. 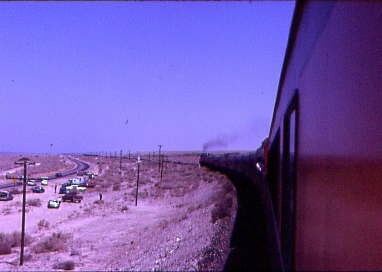 The siding names were Dixie, Arlington, Gillespie, Saddle, Hyder and Kofa with our train passing by each of them with no more delays. We were out in true Sonoran Desert with little traces of man except for the two ribbons of steel our train was riding upon. 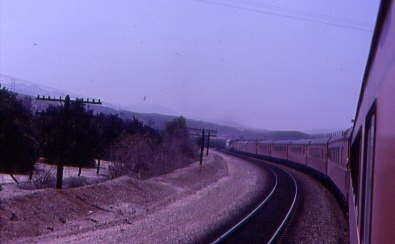 The countryside was turning more hilly as the extra 4449 West steamed westward into the heat of the afternoon. It was a perfectly clear day and the visibility was unlimited. With views like these, I was sure glad I took this trip allowing me to see all of this countryside in broad daylight from a Daylight Train. It was announced that we would be doing a photo runby at the Gila River Bridge and everyone was looking at their trip literature or AAA maps to see exactly how far it was to the location of our runby. Eighteen miles was the universal answer so everyone sat back and waited patiently. 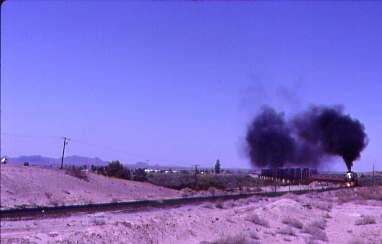 Twenty four minutes later, the extra 4449 West was crossing the Gila River and slowed to a stop when the train was completely off of the bridge. Everyone detrained and were ushered across a small ravine to along side of a road which the edge of would be the photo line. The 4449 and train backed up slowly across the bridge with myself shooting pictures of this event just in case something would happen with the camera on the real runby then at least I managed to get a picture of the train anywhere at the runby location. Every runby I do I follow this practice with great success. The train backed a good mile and once everyone was quiet, the trip's coordinator gave the ok and the show began. 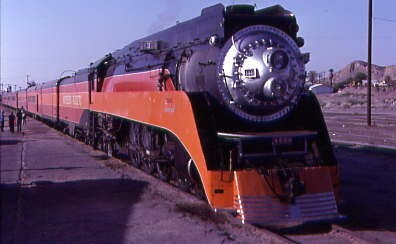 Here came the 4449 charging, bellowing out black smoke and blasting it's whistle. It came a charging across the Gila River Bridge and the ground shock as it passed the photo line location with huge amounts of Kodachrome and video film being used. The train came to a stop before backing up to pick all of us up. It was a great place for a Photo Runby, the only drawback was the sun was on the wrong side due to our late departure from Phoenix. It was just one of those things that remind me of the Rolling Stones song, "You can't always get what you want!" The air conditioning inside the train sure felt good again to my hot and sweaty body. I went to the lounge car for a couple of ice cold beers that really hit the spot. I found on open vestibule as the train passed through Roll and slowly made its way to Welton where we joined the Southern Pacific's main freight line that we would travel over to tonight's layover point of Yuma. 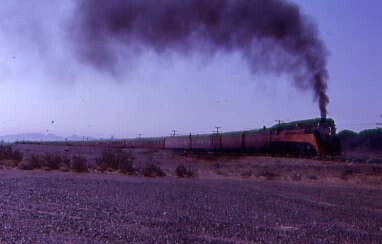 We headed down the double tracks mainline to Dome where the route reverts to single track to Yuma. We entered the Gila River Canyon that took the train through the mountain range east of Yuma. It has some interesting possibility for railroad photography if I'm ever back in the area. 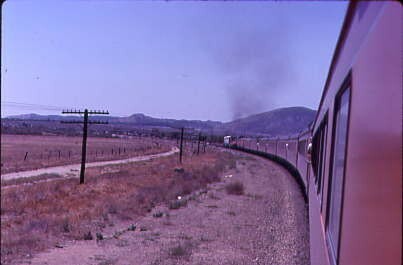 We passed the siding at Kinter in the west end of the canyon before emerging onto the flatlands passing through the orange groves and other agricultural interests. We sped through Fortuna and run the final miles into Yuma, first passing East Yard before the extra 4449 West pulled up to the Amtrak Station in Yuma ending day one of the trip. I detrained and stopped to look at the train they call the most beautiful train in the world! I enjoyed the one hundred sixty three daylight running we did today and tomorrow I should get another two hundred fifty four more daylight running miles aboard the extra 4449 West. We were bused to out hotels and everyone had a chance to get cleaned up and relax with me making a liquor store run. We all were then bused to the San Diego Padre Spring Training Facility where the City of Yuma treated us to excellent steak dinner. All we had to do in return was listen to the Yuma High School singing group who were about to go to Hawaii for a competition. They were very good singers and I enjoyed their performance. I returned to my hotel room later for a few nightcaps and a well deserved rest in a hotel bed to be ready for tomorrow's adventure. 6/17/84 The next morning I awoke, showered and then had a breakfast of pancakes, sausage and juice with other members of our group. We discussed the miles of railroad that laid in front of us to Los Angeles. Following breakfast, we were supposed to be bused down to the Amtrak depot but the driver let us all out at the 4449 which was on a spur track. while we all hustled on foot to the Amtrak depot to be in place for an unofficial photo runby of the train pulling into the station. 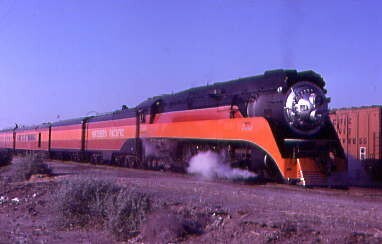 After everyone got their excellent shots of the train, we walked around the rear end and boarded our coaches to wait for the on time departure from Yuma behind the Southern Pacific Daylight Locomotive 4449. Extra 4449 West departed Yuma right on time with an excitement of the passengers on board at a much higher this morning for some reason. 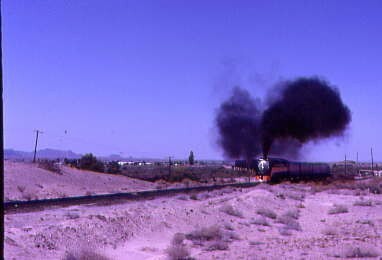 The train puffed by the Yuma Territorial Prison before steaming across the Colorado River and entering the state of California. The 4449 looked so good as it crossed off of the bridge in the morning light. The train picked up speed through Winterhaven as it travelled across the agricultural rich floodplain of the Colorado River. There were a few people taking pictures of the train yet I know that their numbers would grow quickly the closer we get to Los Angeles. 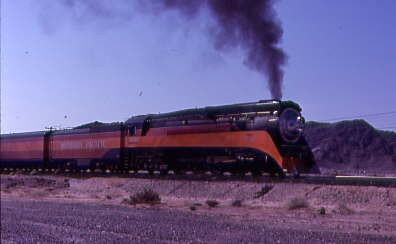 The 4449 climbed out of the Colorado River Valley through some nice sand cuts and once it had crossed the All American Canal the train slowed for our Photo Runby of the day. We detrained, the train backed around a curve out of sight and all became quiet. 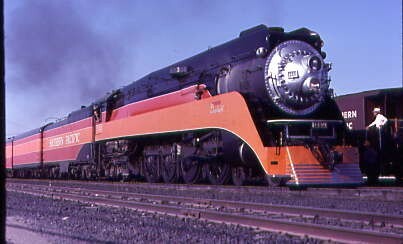 The 4449 blew it's whistle and then started it's charge towards us. The sound it made was totally incredible while the shot was back lit. I managed a great shot of the 4449 looking like a coal burner from a background hill. It was a great picture yesterday and great sound effects this morning. It's a very special engine and I was glad to have the chance to ride behind the 4449. 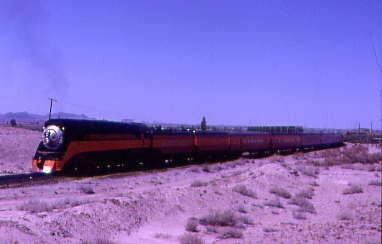 We re boarded the extra 4449 west and headed northwest once more running between the Chocolate Mountains to the east and the miles of Glamis Sand Dunes to the west. The train made track speed passing the sidings of Dunes, Cactus, Clyde. Glamis and Acolita all which were in very sandy environments. The countryside was very interesting to see in daylight and I want to come back here to take some pictures some day. In the area between Regina and Iris the railroad had planted Tamarack Trees to keep the sand off of the tracks as the railroad passes through the heart of the sand dunes. 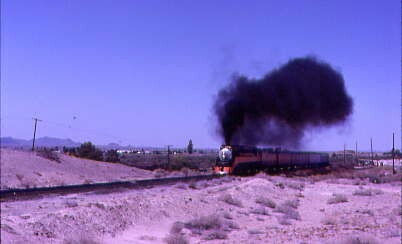 The extra 4449 west crossed the Highline Canal before we descended to Niland where the paved highway returned and the train chasers waited. The train steamed on through and the races began. It's not the train whose racing , it's the drivers of the cars each trying to beat each other to another photo location somewhere ahead of the train. Impeding their efforts are those people who must pace the engine watching the drivers go around and around. Added to all of this madness are the innocent drivers coming the other way not even knowing we were coming who now had do deal with all of this. As we approached Wister, I was watching more traffic laws being broken as I had ever seen in my life. I was riding in the vestibule watching this circus of traffic which was highly entertaining. The extra 4449 West was cruising along the Salton Sea to the west of us with MT San Jacinto standing guard over the whole scene to the northwest. For the chasers some good news was that the border checkpoint was closed. The most fun on a trip like this of course is the ride steam engine and the second thing is watching the people off the train perform for you. 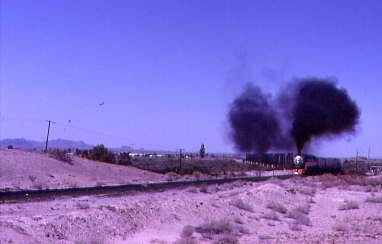 I was thoroughly into the whole atmosphere as the train ran along the Salton Sea. The sea itself wasn't even here until 1905 when they were building the All American Canal and a Colorado River flood sent water rushing down into the natural depression that was located here. As the new lake rose the railroad had to relocate to higher ground before they could stop the rush of water and stabilize the height of the new lake. With all the salt on the ground, the lake became saltier and was given the name the Salton Sea. What was a manmade disaster become something very beautiful. 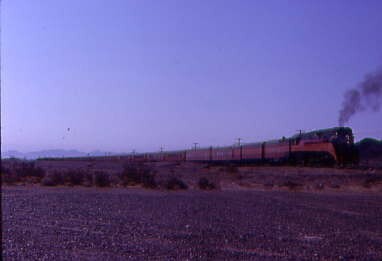 As we continued along the Salton Sea we passed by the sidings of Frink made a large "S" curve to Bertram before we crossed Salt Creek to Ferrum with the connection to the Eagle Mountain Railroad. 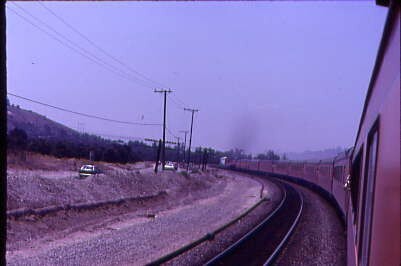 This railroad hauled iron ore from Eagle Mountain to here where the SP would take it to Kaiser Steel's plant in Fontana. 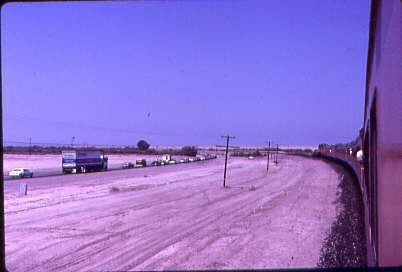 We next passed Mortmar before we left the Salton Sea heading through the date and orange groves to Mecca, Thermal, Cochella and Indio where we stopped to water and service the 4449. 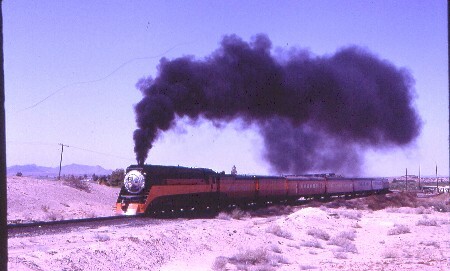 We proceeded up the grade west of town to Thousand Palms where we came to a stop on the mainline. At a Thousand Palms we added two very special helper units to the point of our train. 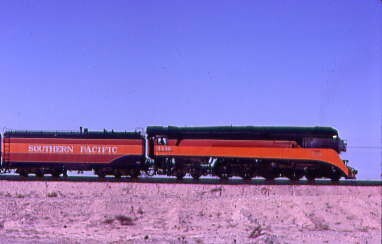 The SP 7347 was painted up for the 1984 Summer Olympics in Los Angles and the SP 7342 was in a Daylight paint scheme. They we added for the climb over Beaumont Hill the low point between MT San Jacinto to the south and Mount San Gorgonio to the north. We passed between the Tamarack Trees that stop the sand from invading the right way and came out of them at Garnet. The train was working hard up the grade crossing the many channels of the Whitewater River to West Palm Springs where even more chasers were waiting for us. Never slowing we climbed to Cabazon with the two dinosaurs standing to the north before we climbed to Banning at on up to the Summit of Beaumont Hill at Apex. We descended through Beaumont to San Timiteo Canyon where I knew the chasers would be the most interesting. We headed with everyone jockeying for better position only to be made to come dead in their tracks at the grade crossing above El Casco. The road was empty until the train had cleared when here they all came again now in a more maddening chase. It was sure different seeing San Timiteo from the train in daylight than looking at a train here. I'm saw things I've never noticed before. I so glad I took this trip. Near the west end of the canyon we passed through the orange groves near Redlands before once again we stopped all the chasers dead in their tracks at the lower grade crossing of San Timiteo Canyon Road. 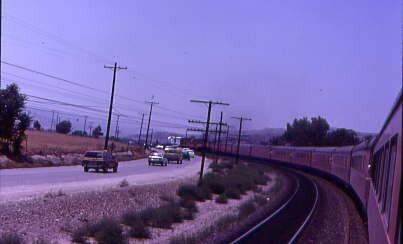 We sprinted through Loma Linda, crossed the Santa Ana River, passed through the old Colton Yard, went by Colton Tower before climbing the short hill to SP's West Colton Yard where our helpers were cut off the point of the extra 4449 West. 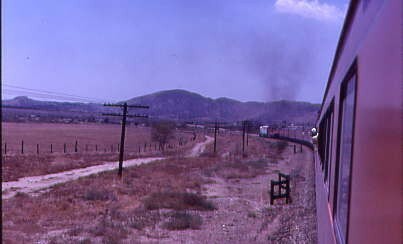 From West Colton, the extra 4449 West sprinted across the San Bernardino Valley with the San Gabriel Mountains to the north, Santa Ana Mountains to the southwest and the Chino Hills directly west. 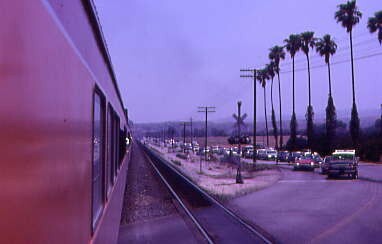 We sped through Fontana, cruised by the Ontario Airport, went west into Ontario, Montclair and to Pomona with thousands of people watching the steam train passing through their town. The engineer was really laying on the whistle which was music to my ears. Everyone was waving at the train as we roared by with all of us passengers waving back. This is really an event. We passed through the Chino Hills near Walnut before passing through SP's City of Industry Yard before crossing the San Gabriel River. Now the last question of this trip. would the extra 4449 West be routed down the State Street line or via San Gabriel? At El Monte we got the answer as we had a high green signal as the extra 4449 West headed straight for San Gabriel. We took the concrete trench through Alhambra prior to splitting the hills, going along the north side of the LATC and crossing the Los Angeles River. we went by Mission Tower and pulled into track number five at Los Angeles Union Station where we were greeted by a large crowd. This ended my first mainline steam excursion trip. I detrained off the Daylight train set and walked through the crowd to the front end for a few last pictures of the Southern Pacific 4449. With all that done, I stared at the engine in almost disbelief that in 1984 I had just ridden an all Daylight painted train set pulled by a Daylight steam locomotive having felt I had just stepped off of a time machine. What an adventure I had just lived through these last two days but now reality had caught back up to me as I now had to catch a San Diegan to take me home to Santa Ana where some day another adventure would be waiting for me to begin. 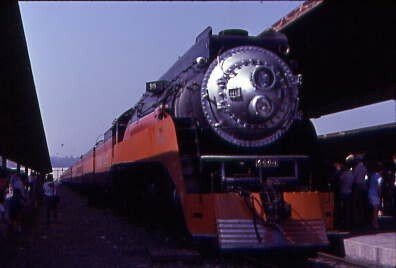 For more SP 4449 pictures from 1984 click here!